The former president of the National Association of Independent Schools (NAIS), Pat Bassett, led a series of in-depth sessions for the Board of Trustees and the leadership team August 13-14. He will lead periodic sessions for JA trustees and staff over the next 18 months. The leadership team heard a presentation on “The Moral Life of School: Teaching Ethical Thinking & Moral Courage” on Thursday afternoon. In this session, Bassett pointed out that nationally 20 percent of parents choose a school based on what is referred to as the “second curriculum,” the character portion or formative impact of the school. Bassett commented that the percentage is likely much higher in schools like JA that have articulated a strong mission. He encourages schools to magnify this impact by being more intentional about initiatives that develop qualities of character such as compassion, honesty, fairness, responsibility, and respect. Bassett pointed out that students who choose to live a moral life have a higher likelihood of also being successful and happy. JA’s 2015-2020 strategic plan is centered on helping students develop lives of purpose and significance in keeping with these values. This session was followed by “Board Governance 101/201/301: Level Three Leadership for Heads & Boards” for the trustees Thursday evening. Bassett spoke about the changing landscape of education and trustees’ roles as leaders. He outlined current practices in school governance and methods for effectiveness. 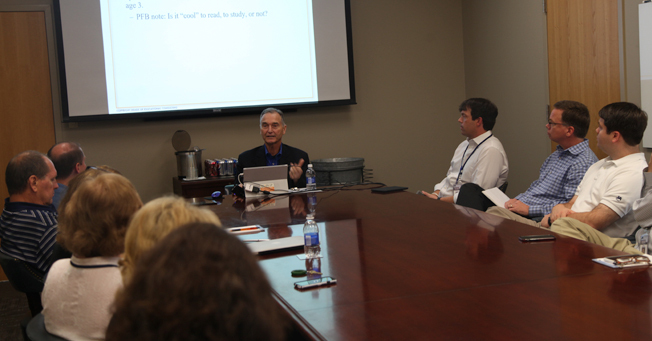 His Friday presentation to the leadership team focused on “Schools of the Future: The Big Shifts” where Bassett explained six areas of educational change currently underway or expected in the future. Bassett complimented JA for being innovative and progressive around the issues where educational shifts are taking place. These include a shift from “knowing” to “doing,” such as the approach used in JA STEM labs. A second shift involves how information is processed, with students moving away from simply being consumers of facts toward being critical thinkers who gather and interpret information. For more about shifts in education, see the MacArthur Foundation’s Report: The 21st Century Learner at www.macfound.org/videos/106. Bassett was president of the National Association of Independent Schools (NAIS) for 12 years. NAIS provides services to more than 1,700 schools and associations of schools in the United States and abroad, including 1,400 nonprofit, private K-12 schools in the U.S. that are self-determining in mission and program and are governed by independent boards.Bassett is now a senior consultant to schools and organizations on issues such as leadership, governance, and strategy. He has a long career with roles as teacher, coach, dorm parent, and headmaster in independent schools.